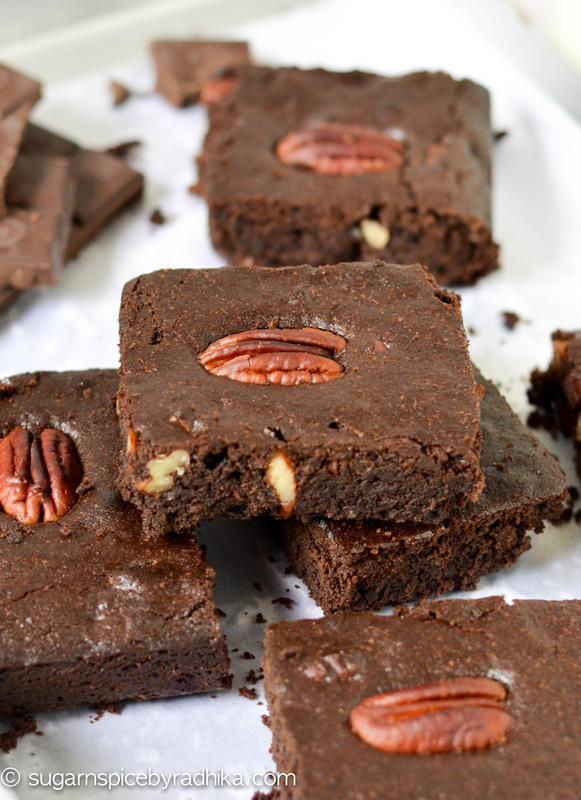 My most loved recipe that makes super fudgy and eggless Pecan Brownies to die for! For me, chocolates work as a great solution for good and bad days. No matter what, a good dose of chocolate dessert just lifts my mood. 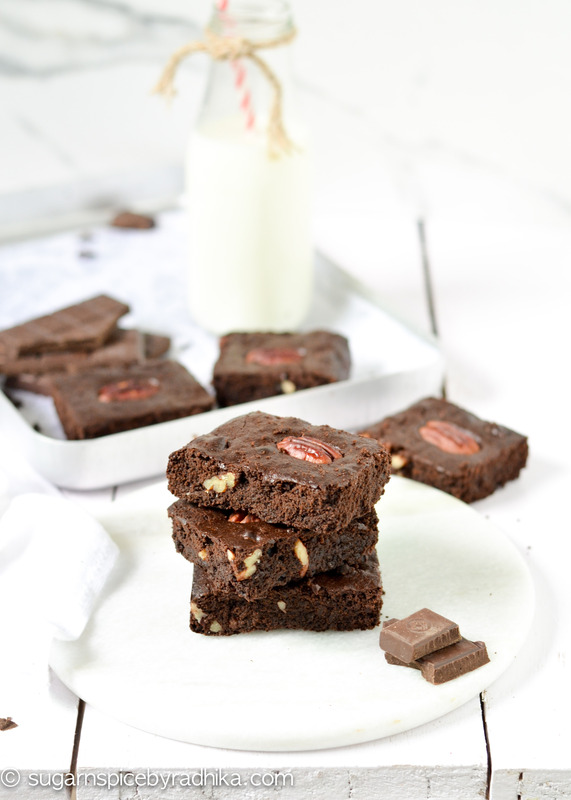 My most loved recipe is my super fudgy chocolate brownies because they’re quick and easy. 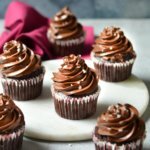 They’re decadent and always a hit with everyone. This time I planned to do another version of brownies with pecans on top. (if you don’t find pecans in the market, you could even replace them with walnuts since they taste the same and look similar.). This one-pot recipe is quick and easy with lots of chocolatey goodness. 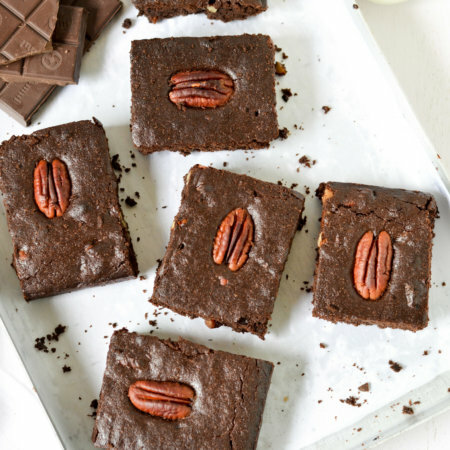 All you have to do is just combine all the ingredients together and you have your delicious Pecan Brownies ready. 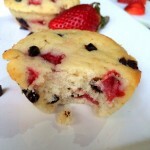 They work great for spontaneous afternoon teas and dinner time desserts. 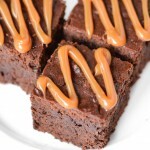 For this recipe, I have used condensed milk as it gives just the bright amount of fudginess to the brownies. It also works well as an egg substitute too. 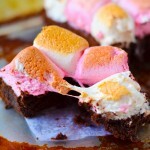 My secret ingredient for this recipe is coca-cola and I have been adding this to all my brownie recipes now. I learnt about this in a baking workshop that I attended 10 years back and I am still following it. Coca-cola gives a nice colour, delicious flavour and puff to the brownies. 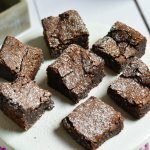 So all you need is some handful of ingredients, 25 minutes, and you have your delicious fudgy brownies ready! 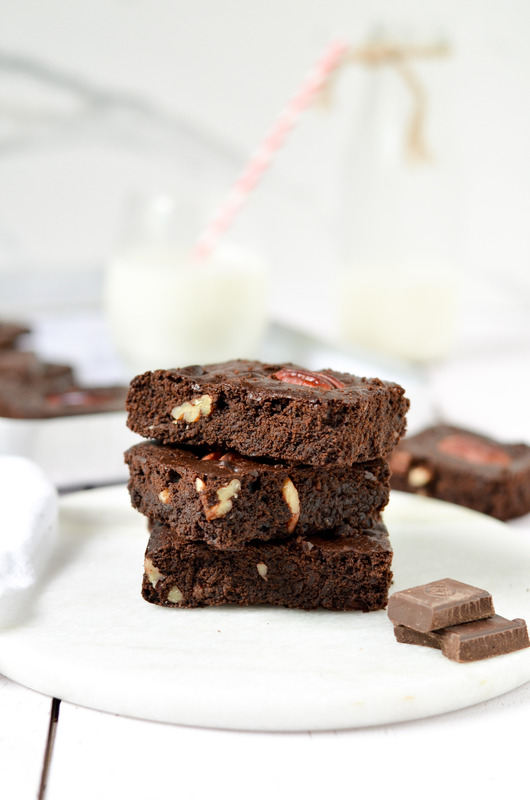 My most loved formula that makes super fudgy and eggless Pecan Brownies to die for! Flour (maida), 1½ cups or 190 grams approx. Grease a 13x9 inch baking tray with butter and line it with parchment paper. Preheat oven to 160 degrees Celsius. 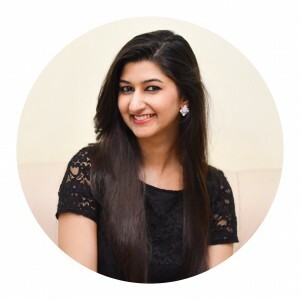 In a large bowl, melt butter and chopped chocolate in microwave until melted completely. Make sure you stop the microwave after every 15 seconds to stir them to avoid the chocolate from burning. It would be great if both chocolate and butter are at room temperature before you begin. Once melted, add caster sugar, condensed milk and milk to the same bowl and whisk them in. You don't need a mixer for this recipe, use a hand whisk. On an electric mixer, keep it on very low speed. Once these are mixed, add in the vanilla, followed by the dry ingredients (flour, cocoa and baking powder) and finally the Coca Cola. Whisk everything until you have a smooth batter. Fold in the chopped pecans. Pour this into your prepared tin, and line the top with Pecans. 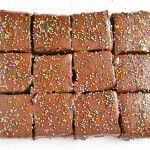 I usually place them about 1-1.5 inches away from each other so there's plenty of room in between for me to cut my brownies into equal squares. 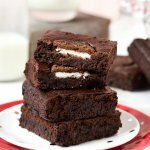 Once done, bake these brownies in a preheated oven at 180 degrees celsius for 20-25 minutes or until the top looks cooked. If you insert the skewer at this point it will come out wet because of all that melted chocolate but that's okay. 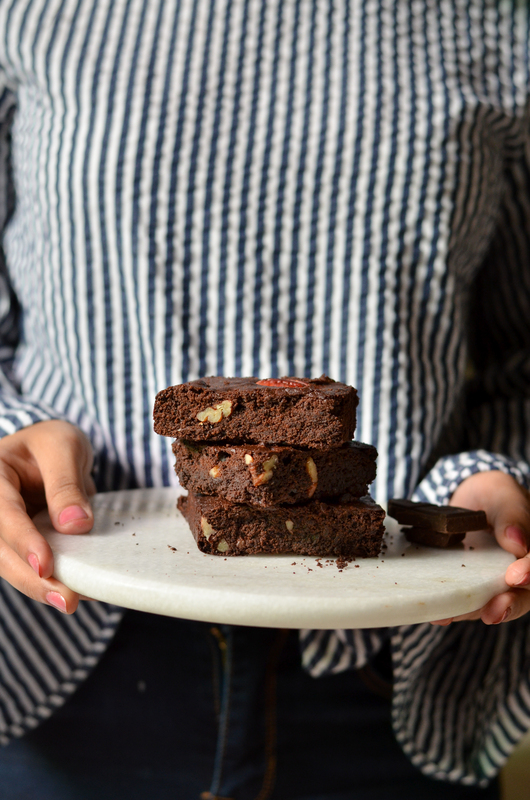 If your tin is smaller and your brownies deeper, you'll have to bake them longer. All measurements are US standard measuring cups and spoons. Please use proper measuring equipments to get the same results. 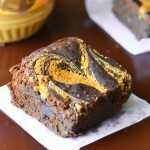 Coco Cola is a great addition to the recipe as it lends a certain colour and helps keep the brownies nice and moist. YOU WILL BE ABLE TO TASTE IT.